In a dramatic move, Pakistan Army has freed five hostages from the Taliban, which have been missing since five years. 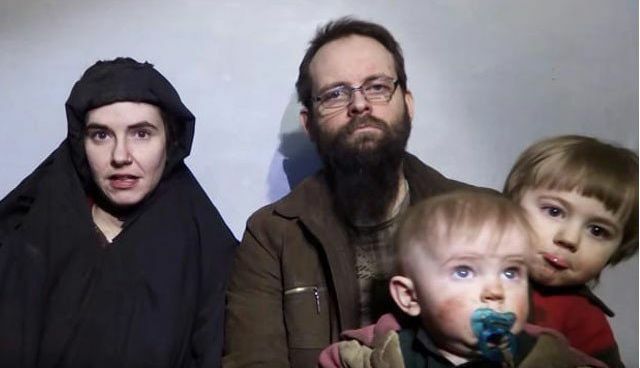 As per news reports, an American woman and her Canadian husband along with their three young children, who were held hostage by militants, believed to be held by the Taliban-allied Haqqani network in Afghanistan for five years, have been freed. Caitlan Coleman was five months pregnant when she and her Canadian husband Joshua Boyle were abducted in 2012. The three children were born during the captivity. Wretched man that he is! Subjects his own wife to a miserable life, trying to be a self righteous do-gooder, saving all Muslims from Taliban! Who the hell does he think he is? Now he has three little children, all slaves of the same idiotic mentality. He passed his own curse onto their own! The words have become true: "A blind leading the blind, both will fall in the pit".